Carlton Willey was a Down Easter all the way, born and raised in Cherryfield, Maine (on June 6, 1931), where he lived out his life until his passing on July 21, 2009, in nearby Ellsworth. “We played baseball every chance we could get – every day in the summertime – when we could get enough to play,” Carlton told me when I visited him in his Cherryfield home in early April of 1991. He was talking about his youth, in the 1930s and 1940s, but I have a strong suspicion that he’d join in a game on that day given any sort of an opportunity. At the age of 59 he yet maintained the tall, lean look of a man who can play ball. The right-hander stood an even 6 feet tall and was listed as weighing 175 pounds. In his early playing days, in the makeshift fields (“We’d use rocks for bases”) around Cherryfield and for Cherryfield Academy, Carlton was both an outfielder and a pitcher. Heck, with only 13 kids – seven girls and six boys – in his entire Academy graduating class he most likely could have played half the infield and done a little catching, too, if he’d been so inspired! Upon his graduation from Cherryfield Academy (a public school), his dad asked Carlton what he planned to do with his future. “You know, Carlton, you can’t play baseball for a living,” were his father’s words of advice. Decades later, Carlton still chuckled at that. It was the Braves who gave Carlton his shot to do just that: play baseball for a living. They were the Boston Braves then. 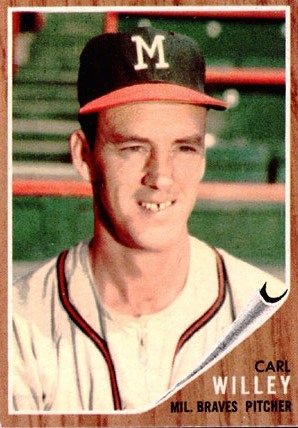 Carlton, after a tryout at a Braves camp in Brewer in the spring of 1950, was placed on the Bangor club, one of four teams the Braves had placed in Maine and stocked with prospects. The four teams would play one another all summer long and then, at season’s end, the Braves would invite three top prospects down to Boston for a full tryout. Carlton was one of the three. At Braves Field his fastball – later to be clocked at 93 mph – and his keen sense of competition so impressed the Braves’ brain trust that they signed him to a contract. First stop was with the Quebec Braves in the old Provincial League in 1951. There Carlton was 15-5 and led the circuit in earned-run average (1.96) and won-lost percentage (.750). In 1952 he moved up to Atlanta, then in the Southern Associa­tion, where he was 10-6. Carlton’s record the first two seasons he returned to Organized Baseball certainly bespoke his problems. With Toledo in 1955 he was 8-10; with Wichita in 1956 he was worse, ending with a 5-10 mark. In 1957, however, things began to click again. Really click. Carlton’s rhythm re­turned. So did his winning ways. Still with Wichita, he tore up the American Association, leading the loop in innings pitched (247), games won (21), and won-lost percentage (he was 21-6, which works out to .778). He also struck out 174, while walking only 94. To top it all off, he was selected the American Association’s Most Valuable Player. Coming off his marvelous 1957 season with his parent club’s top farm team should have guaranteed Carlton star-of-the-future treatment at the Braves’ 1958 spring-training site. It didn’t. The problem was that the Braves – who’d moved to Milwaukee after the 1952 season and who had prospered immeasurably in the en­suing years – already possessed a fine pitching staff. With Warren Spahn, Lew Burdette, and Bob Buhl they’d swept the National League in 1957 and then went on to humble the mighty New York Yankees in the World Series, too. Willey’s only role was to close out Game Five with one full inning in the 7-0 loss. He faced three Yankees and struck out two of them. The Braves kept Carlton on their roster as the 1958 season began. After letting him sit idle the first month of the season, though, they farmed him back to Wichita. Frustrated, to say the least, Carlton nonetheless re­solved to make it back to Milwaukee to stay. It took a no-hitter – against Louisville on May 22 – to get the Braves to recall him. But they did. And this time Carlton did stay. It took another month of inactivity before Willey got his first start in the bigs, but when he did start he certainly made the most of it. On June 23, he checked the hard-hitting San Francisco Giants, 8-0, on a six-hitter. It was a historic game in another way as well: One of the Giants’ six hits – all of which were singles – was Willie Mays’ 1,000th major-league hit. Carlton notched two more goose-egg games before the season was out, giving him a total of four. Now four shutouts may not sound like a whole lot, but in 1958 it was more than teammates Spahn (who had two) or Burdette (three) had. It was more than Robin Roberts (one). And it was more than 22-game winner Bob Friend (one). In fact, it was more than anyone else in the league had. Carlton Willey – as a rookie who was with Milwaukee only part of the season – led the National League in shutouts in 1958! After that impressive season, Willey never really blossomed with the Braves the way it was hoped he would. The reason was basic: With a strong and experienced staff in place, a newcomer just doesn’t get the chance to work on a regular basis. Timing slips. That’s what happened with Carlton. After his first season, he was used infrequently for the next four. In what should have been his prime, he’d get an occasional start. Mostly he sat. Finally, after the 1962 season – in which he started but six games – the generally reserved Willey demanded to be traded. Willey’s career batting average was .099, but he had the occasional big hit, including a grand slam on July 15, 1963, one of his two home runs. Carlton’s jaw was broken. Oh, he recovered. But he’d lost weight; a wired jaw is not conducive to hearty eating. Next he hurt his arm a couple of times. The first time it was tendinitis. Then it was a torn muscle in his forearm. Carlton still winced when he talked about the pain he went through that season, a season in which he pitched but 30 total innings. After yet another disappointing season in 1965, Willey decided it was time to pack it in. He scouted for the Phillies for the better part of a decade, first in the Midwest and then throughout New England. But the solitude and constant travel got to him. He came back to Cherryfield. In his later years, Carlton worked for the state as a probation/parole officer, managed a blueberry-freezing plant for Jasper Wyman & Son, and raised Christmas trees. He did a little painting and a little light hauling, and spent as much time as possible with his son, Richie, and his daughter, Jill. When I asked him why – after the bright lights of Milwaukee and New York – he returned to Cherryfield, Carlton paused a second and then replied: “This is home, I guess. It’s hard to get away from.” It was a good answer.